Did you know that there are over 1 billion active Google Chrome users in the world? I'm one of them and chances are that you may also be reading this on your Chrome browser. There are plenty of personalized options that Chrome offers its users, extensions being one of them. In this article, I'm going to show you the Best Google Chrome Extensions that I find very useful. Every now and then, we all need to take screenshots of a particular page being displayed. You may need to save a screenshot of a utility payment that you just made or may need a screenshot for other reasons, Nimbus screenshot extension lets you take one easily. Why should you install this extension when you can easily take a screenshot using the 'Print screen' option? Well, the print screen option only lets you take a screenshot of the visible part of the page being displayed on the screen. Nothing over it, nothing below it. 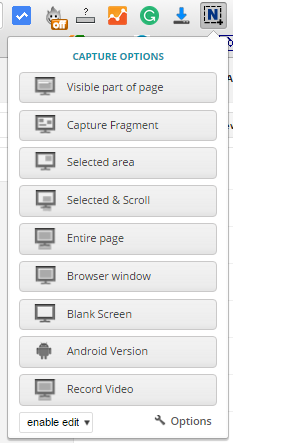 The Nimbus Screenshot extension, on the other hand, can easily let you take a screenshot of the entire page, selected area, visible part among other options as shown in the picture above. 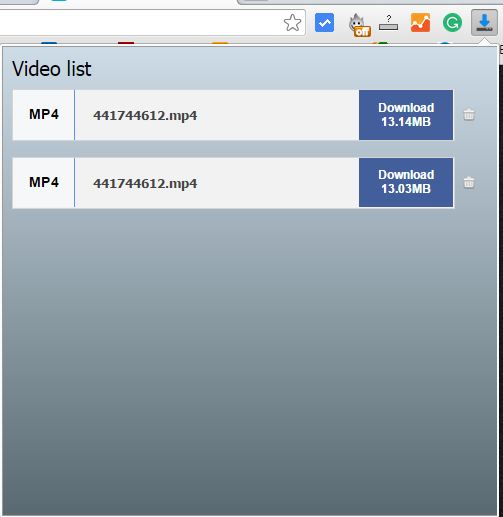 Additionally it can also record your screen activity in a video format and save it on the hard drive. This is a brilliant little extension in my opinion and should be a part of everyone's Chrome browser. This is one VPN extension that is very useful for anyone who hates to see blocked websites based on his country or region. This is also very useful in cases where you need to visit a particular website based in another country, but your browser keeps redirecting you to your country's version of the same website. An excellent example is the Google Play Store. If you'd like to see the products available on the USA version of Google Play Store, heading to the Play Store website from India will redirect you to the Indian version of the Play Store. 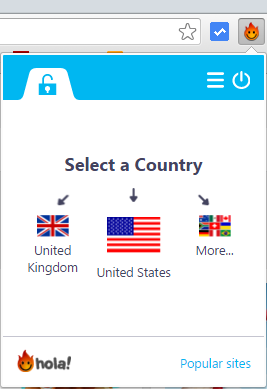 Switch the Hola VPN extension On, select the country from where you'd like to visit a particular website and type in the website address in the address bar. Voila! This time around you'd be able to see the website for that particular country. Pretty easy, isn't it? Do you often find yourself making silly grammatical or spelling mistakes whenever you write? Well, I do! And for someone who blogs and writes articles, making spelling mistakes/grammatical errors is a strict no-no. This is where Grammarly Chrome extension comes into the picture. This extension continuously scans through the content in real-time as you write and flags any spelling/grammatical or punctuation errors. I am being informed of the errors I have made so far while writing this article for you. This is an excellent extension for writers and bloggers who have to write a lot. Do watch a lot of videos on the internet? Do you also like to save them on your hard drive to view them later? In the past, I've also used a lot of programs/websites on the Internet that allow you to download a particular video, however, it's a very complex procedure and takes up a lot of time. This little extension, once installed lets you download the streaming video in just under two clicks. All you need to make sure is that the video is playing in the browser and click the extension icon to get the option to download the video on your hard drive. The only downside/restriction of this extension is, that it will not allow you to download YouTube videos. This is part of their terms and conditions and will not work on YouTube. If you appreciate good content (articles, images, videos) on the internet and like to share it through various social networks, this extension is made for you. Once installed, all you need to do is click the social network of your choice and the website URL/content currently being displayed on your browser will automatically be posted on the network of your choice. This extension currently lets you share content on over 300 social media networks including Facebook, Twitter, StumbleUpon, Tumblr, Pinterest etc. A must have for socialites. I hope this article was useful to you. Please let me know your comments in the comment section below. Also, please let mention your favorite extensions so that other readers can also make use of them.